​Painting down the value scale from light through middle value to dark is the traditional approach figure painters have used for generation. The big advantage to the traditional approach is that the artist can see the painting taking shape and still have lots of room for alterations and adjustments. "The traditonal approach will have a healthy future in watercolor because," Don says, "it works!" 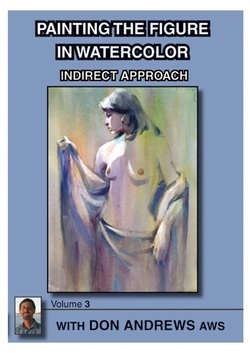 ​If you paint things well but there's a lack of direction in the overall mood of your figure paintings, the indirect approach will help you. By wetting down the paper, disregarding the drawing and applying several granular washes across the entire page, a sense of unity is beautifully established. 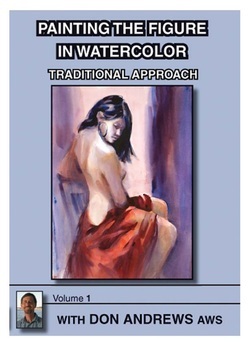 If your figure paintings lack direction in their overall mood, you'll love the indirect approach! ​If your figure paintings start out fresh but the murkiness comes in the middle values and darks, try the direct approach. By directly painting the structural shadow pattern of the figure with middle and dark values first, those strong values appear rich and luminous. If your paintings suffer from lifeless middle and dark values, the direct approach is for you! ﻿No matter how well you paint the figure, if the background doesn't work the painting fails. 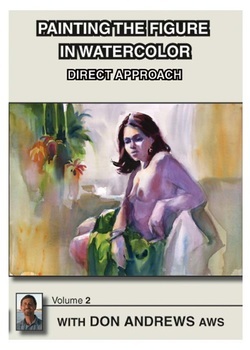 Don has devoted this dvd to helping you better build the proper relationship between the figure and the background. 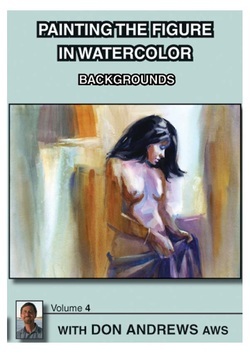 He'll show you how large shapes, color repeats and soft edges are utilized so the background always compliments the figure; key to the success of any figure painting. This video contains six lecture demonstrations taken from Don's figure painting workshops. You'll receive invaluable insights into his goals and thinking as he paints. Lecture demonstrations include: drawing, page layout, facial structure, lighting and photographing the model, arranging the light, counterbalance and much, much more. This video contains 6 lecture demonstrations taken from Don's figure painting workshops. You'll receive invaluable insights into his goals and thinking as he paints. Lecture demonstrations include: mixing living flesh, linkage, color, value, granulation, color temperature dominance, edge quality, capturing the light and much much more.